Have you ever been a sufferer of picture loss? The loss of a large number of precious pictures can be unaffordable and unendurable. The problem become more severe when there is recent backup at hand to restore lost pictures. However, there is still hope to get deleted picture recovered if you finish reading this post. Thankfully, deleted picture recovery can be done by specially designed software, so we need to find proper picture recovery software first before starting recovery process. You can follow the advice below to check the recovery software you find. This step is important, for recovery software is responsible for major recovery result. Thus it is necessary to select one good recovery tool. Make sure the entire picture process is read-only to original device, otherwise lost files may be damaged. The recovery tool should be able to offer preview of deleted pictured before the actual recovery or payment. The picture recovery software should be trusted, reliable and effective. Choose those tools that has a wizard interface so that the recovery process will be quite easy. Eassos Recovery can be used to undelete pictures and do deleted picture recovery from a bunch of storage devices including memory card (SD card, CF card, XD card, SmartMedia, etc. ), USB flash drive, hard drive, portable drive, etc. These storage devices usually adopt FAT32 or NTFS file system which uses file entries, so that deleted pictures are recoverable. It is file entry that is deleted when a picture is deleted, after which the deleted picture won’t be visible or accessible to operating system and users. However, picture data partition is still saved on sectors on storage devices. 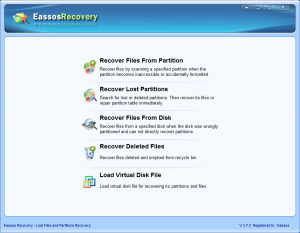 Eassos Recovery makes use of the principle and scans all sectors so that deleted pictured and by found and restores. The difficult of picture recovery is that picture are often saved in various file formats, like png, ipeg, tiff, jpg, gif, raw, etc. and each file format has its own way of storing data. Thus the picture recovery software should be very good at analyzing all picture file formats to guarantee better recovery result. 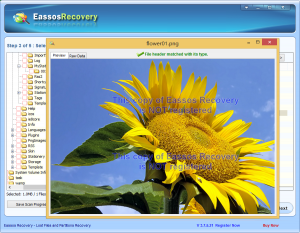 Eassos Recovery is professional picture and photo recovery software developed by a team that has devoted to data recovery over files years. The picture recovery tool is recommended by numerous users. Now let’s see steps of recovering lost pictures. 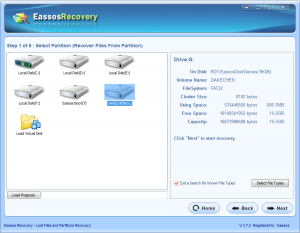 Step 1: Launch Eassos Recovery and select recovery feature for lost pictures. Step 2: Select storage devices and click “Next” to search for missing pictures. Step 3: Preview and save desired pictures and finish picture recovery. This entry was posted in Data Recovery and tagged Deleted picture recovery, picture recovery software, undelete pictures by EASSOS. Bookmark the permalink.